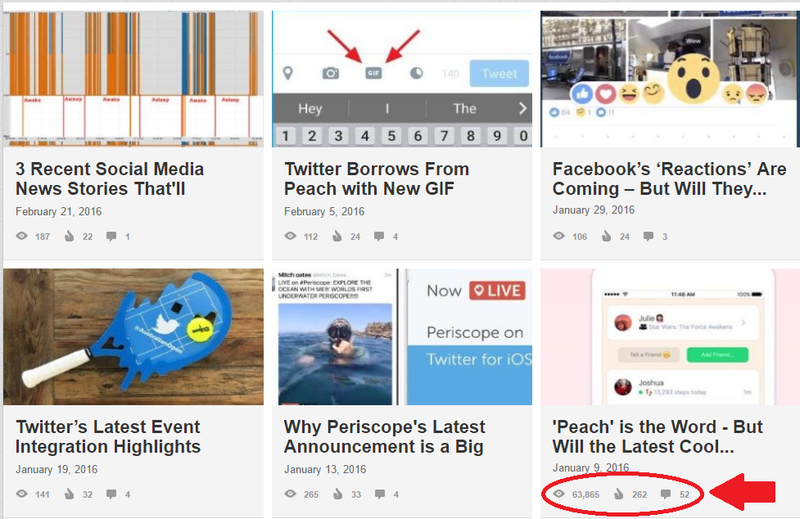 Since opening up their long-form publishing platform back in February 2014, more than a million LinkedIn members have utilized the option, and are uploading more than 130,000 posts every week. The addition of an on-platform blogging tool has helped LinkedIn diversify their offering and showcase their network as more than a digital resume and job search destination. And now, LinkedIn's looking to give publishers more opportunity to showcase their long-form posts, announcing a re-vamp of their publishing editor and a new range of presentation options. LinkedIn has replaced the previous TinyMCE based system with one based on Quill, providing them with a range of new tools. First off, they've added full-bleed cover images to make LinkedIn Publishing a more immersive experience. LinkedIn's also made it easier to add, move and resize multimedia with in-line images, videos, slides, podcasts, and more. "You can enrich your articles, and your readers will appreciate exploring your content in a more engaging way. Just click on the Add Multimedia icon." "You can now add hashtags to an article before you publish, making it easier for professionals to easily discover and search for your content in the Feed." LinkedIn only recently added hashtag functionality back into their system - you can now search via hashtag on LinkedIn's mobile app, with the same functionality coming to desktop shortly. How LinkedIn actually distributes your long form content is another question - many LinkedIn publishers (including myself) have noted that, over time, their LinkedIn post reach has reduced significantly. When LinkedIn's publishing platform was originally launched, the distribution process was simple - your long-form posts were be shared to your 1st degree connections and then further based on engagement. That's since changed, with the explanation on how LinkedIn distributes your long form content now far more complex. 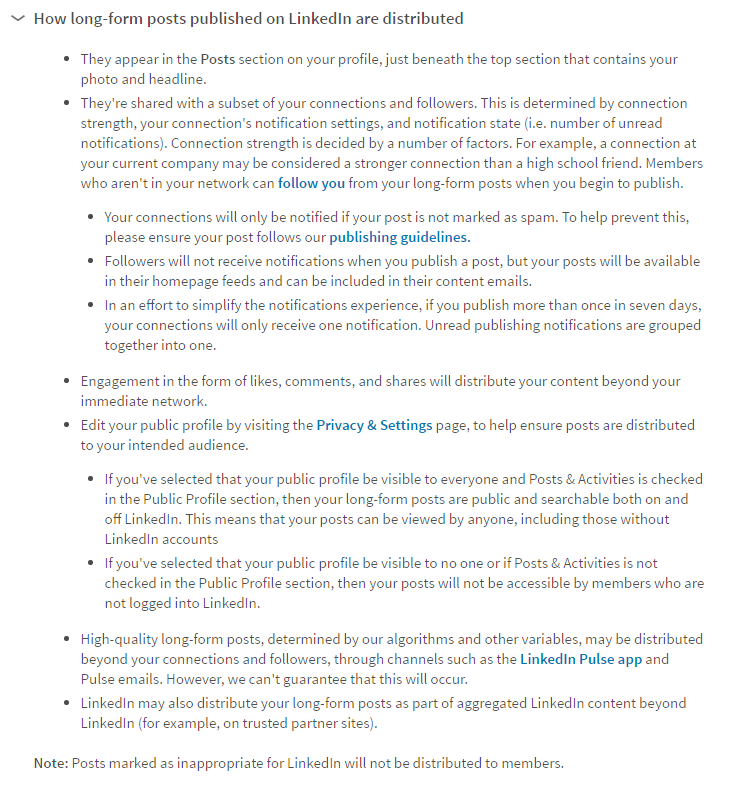 There's a lot more variables at play, but the core information of note is that your long form posts are now only shared "with a subset of your connections and followers", not everyone, which greatly reduces potential reach. The distribution changes have sparked a tide of unrest amongst some user groups who feel LinkedIn has unfairly changed the rules on them, but of course, it's LinkedIn's platform, they can choose to operate it however they wish. And while LinkedIn has never made any official comment on the reasons behind this shift in distribution strategy, the likely reason was an influx of spam and notifications from connections every time a new post went up. To eliminate potential abuse of their platform, and people using it to purely push marketing messages, they've had to change it up - with the emphasis under the new system on quality and response, as opposed to straight reach. While the reach of LinkedIn publisher posts has been reduced, the platform still offers great opportunity for individuals to share their perspective and build their profile online. Your long-form posts are connected to your LinkedIn profile, giving you another way to stand out when people visit, and no doubt LinkedIn already uses signals from the publishing platform to ensure the most relevant match shows up when people conduct a search around your target keywords. If someone's regularly publishing content on LinkedIn and getting good response, chances are they're a good match for their area of expertise. What's more, if you're fortunate enough to have a post picked up by LinkedIn's Pulse editors, the distribution can be massive - take a look at the comparative jump in views and engagement on one of my posts (bottom right) which got picked up earlier this year. These new tools will help make LinkedIn publisher a better reader experience, and with LinkedIn investigating new ways to boost their platform as a content hub, there could be more benefit to posting your content to LinkedIn over time. The new LinkedIn publisher options is only available in the U.S. for now, but will be made available to all users shortly.